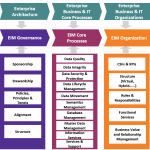 Enterprise Information Management (EIM) is defined through a framework that encompasses: Vision and strategy, governance, core processes, organization and technology infrastructure. Xtensible can be able to help your organization understand where it wants to and needs to go by helping to develop the strategy through our EIM Framework. Many times IT organizations are tasked with the information management because they maintain the technology systems and physical flow through integration of data. Ask yourself; does the IT support actually knows and understand the context of the data and the way it is used within the organization to make decisions? 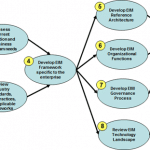 EIM is a business driven activity that needs to be supported by the IT organization. Xtensible has taking both a “handles” on role as well as a more consultative role with companies to help establish their data management effort. More often than not we continue on as a consultative role to help provide the organization with recommendations based on industry standards and previous work experience. There is no question that the right approach to EIM drives individual and organizational performance and profitability. EIM enables standardization of business integration and intelligence while ensuring relevant and timely information is delivered to business users in a form that they can understand. Our framework, used by the NIST Smart Grid Interoperability Panel (SCIP), can help set the foundation for understanding and managing utility company data to drive business value. IT’S OUR JOB TO MAKE SURE YOU CAN DO YOURS. XTENSIBLE IS WITH YOU EVERY DAY, EVERY STEP OF THE WAY.